The Major Repair Programme for Salisbury Cathedral has been an extensive programme of works to repair one of the finest medieval cathedrals in Britain. The work began over 30 years ago, and the programme is now between 90% and 95% complete – with a completion date of 2020. Staff in the Hawksmoor Dorchester office have been supporting the Salisbury Cathedral Trust (SCT) for more than a decade, throughout their careers – including co-sponsoring a summer drinks party to raise awareness of the work that the SCT does. As part of that support, they decided to help raise money for the final stage of the repair work by participating in the SCT’s ‘Sponsor a Stone’ programme – where a sponsor’s initials are carved into the back of the stone before being fixed to the building. When the Cathedral was built each stone was carved by hand, so no two stones are the same size or shape. 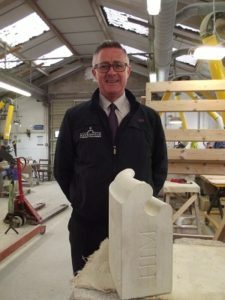 Therefore when stones need replacing, each one has to be hand-carved to order by highly skilled craftsmen and women, using the same techniques used by the original masons. Hawksmoor has sponsored a ‘hood mould’ (also known as a ‘dripstone’ for its ability to direct rainwater away), carved with the initials HIM – for Hawksmoor Investment Management – in an effort to help preserve the fabric of the building for the use and enjoyment of future generations. Read more about the Salisbury Cathedral ‘Sponsor A Stone’ initiative.